Experian credit score is one of the three credit scores that you can obtain. 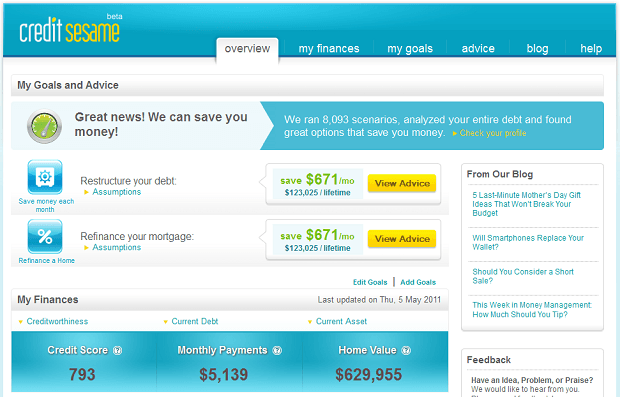 Unlike FICO score, there is a easy and free way to obtain your Experian score from a web site called Credit Sesame. You can sign up to use Credit Sesame for free without giving them any credit card information. All you have to do is just answer a few questions, and within a few minutes, you’ll have access to your credit score, summary of your outstanding debts, and a few money saving recommendations. The sign up process is very simple: two screens for registration, provide them with your social security number so that they can access your information through Experian, and answer 3 challenge questions to verify that you are who you are. Once completed, you will be instantly presented with your credit score, your total monthly debt payments, your home value, and outstanding debts and their balances. You can also jump over to my finances tab and examine your creditworthiness, current debt, and current assets. As an added bonus, it also provides you with various recommendations to help you reduce your monthly payments and save you money over the course of your loans. Last by not least, you can also obtain credit score from TransUnion and get your FICO score. Here are tutorials on how to get these score for free. Thanks for the info. on this website. I’m a complete skeptic, but your website seems very honest and straight forward. I appreciate it!